Carnival doesn’t make any sense to me. It seems like the Catholic holiday for celebrating sin: if we have to be somber and penitent for 40 days we might as well throw a seriously secular party beforehand. 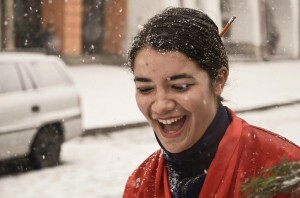 Since most Czechs aren’t religious, they don’t recognize Lent or Carnival, but a Catholic school in an atheist country seems like a great place to celebrate BOTH! At my school, this means a giant school-wide costume-contest-parade. 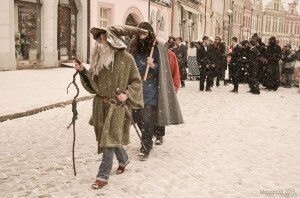 Individuals, groups, and sometimes whole classes prepare costumes, march up to the main square of town, parade in a circle, and present to the judges who award prizes for the best individual and group costumes. Since all this happens in early February, part of the trick is finding a very warm costume too; “cross-country skier” is a fairly popular choice every year. I think it’s especially fun for students to see their respectable professors in crazy costumes. 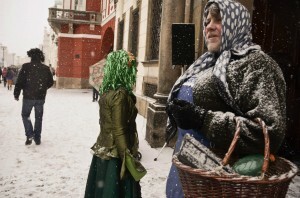 The school principal, for instance, was decked out as a basket-toting village granny, looking like he’d stepped right out of a children’s fairy tale. I was informed that the student government had picked me to be one of the judges, on a committee of teachers and students. 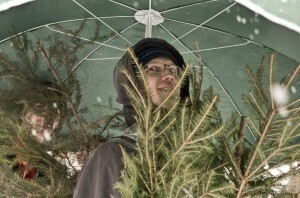 The other teacher spoke good English, and had a large umbrella the judges could huddle under since it was snowing quite a bit. However, he was dressed as a Christmas tree, so we all had to look out for swinging branches if he turned to look at something. What to wear to a school costume party? I lost a little sleep over that one, since I didn’t bring much costume material with me. But I had a big red silk bathrobe left over from Halloween, so I thought I could make something of it. I turned out “Vaguely Asian,” and felt a little uncomfortable just throwing together all my Asian stereotypes and calling it a costume. I just said yes anytime someone asked about my costume. “Oh, you’re Chinese!” Yes. “Oh, a samurai!” Yes. “Aha, a geisha!” Yes. 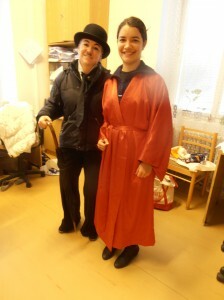 Here’s my “Vaguely Asian” costume with one of my colleagues, Charlie Chaplin. But my concerns about political correctness vanished when I saw a quarter of the graduating class sporting turbans and burkas. More than one terrorist also appeared that morning. All in good fun, I’m sure, but I was rather shocked. Needless to say none of them took home any prizes. 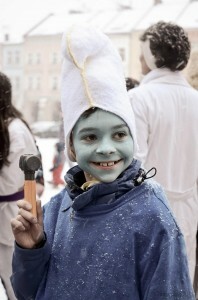 The word for Carnival in Czech is Masopust, more or less “meat” and “fasting” put together. So in that spirit, the grand prize is a pig head. Yes, a literal head of pig, apple in the mouth and everything. Second and third prizes are also smaller, less glamorous cuts of pork. This year’s winners included one of the smallest kids in school appearing as a smurf, a group doing great impressions of Czech presidential candidates, Gandalf with a few dwarfs, a class of dominoes that fell on top of each other if you pushed one, and a couple from “Grease” who are probably still recovering from frostbite. At the end of the procession, we all got jelly-filled donuts, a very standard Czech pastry. We rushed back to school to thaw out, and just for fun I wore my samurai robe to all my classes. This entry was posted in Czech by marissaortiz. Bookmark the permalink.